Art Elements – Component of the Month May Reveal. The Art Elements Component of the Month challenge for February comes courtesy of Jenny Davies-Reazor in the form of these lovely stapled hearts. Not being much of a romantic I’m not a big fan of overtly cute or ‘mushy’ heart art but I do very much like the darker side of these wounded pieces and chose to work with one of the lovely blood-red ones which for once, I remembered to photograph before I started. Whenever you make things for a living or even as a hobby, it’s inevitable that eventually you’ll end up with an over-abundance of ‘stuff’ that takes over any available space in your home. Unsold stock, test pieces, supplies you couldn’t do without but have never used. This has long been a topic of conversation amongst the team over at Art Elements, so much so in fact that we’ve recently launched a Facebook Destash group called Art Elements Extras. Many thanks to everyone who took part in the giveaway and for all your lovely comments which I very much appreciate. I’m now delighted to announce that the lucky winners are..
Congratulations ladies and I will be in touch shortly! New Work for Autumn…And a giveaway! This months Component of the month comes to you courtesy of Jennifer Stout-Cameron who provided the Art Elements team and our guests with these super funky sugar skull beads. I love these beads and wanted to do something fun in keeping with their quirkiness but, the bright colours are not usually something I would work with so it took some thinking. Much of said thinking revolved around flowers and dangles but I didn’t have quite the right colours and then an idea struck me while rummaging around in my jewellery box. Welcome to the 2016 Art Charm Exchange and Auction organised by the talented and indefatigable Jennifer Cameron in support of ‘Beads of Courage’ a charity providing innovative, arts-in-medicine supportive care programs for children coping with serious illness, their families and the health care providers who care for them. ‘The Program is a resilience-based intervention designed to support and strengthen children and families coping with serious illness. Through the program children tell their story using colorful beads as meaningful symbols of courage that commemorate milestones they have achieved along their unique treatment path’. This month’s AJE monthly design challenge is hosted by Caroline Dewison and is all about trees. The image above is of a historic avenue of beech trees at Kingston Lacy in Dorset and is one of my favourite places. Originally 365 trees were planted (one for each day of the year) and they cover a two mile stretch of road which is pure joy to drive at any time of year. Some of the old trees are now beginning to show signs of distress so the National Trust are planting new trees to the side of these beauties so that they failing trees can eventually be replaced. This months AJE design challenge is inspired by the theme of summer – something that is sadly lacking here in the UK as I sit here in a fleece at the end of June! However, my garden is still managing to live up to expectations and that’s where I’ve chosen to draw my inspiration from. I love that time in the garden when most of the hard work is done and you can sit back and enjoy the abundance of your labours…for a couple of months At least. I decided to go with a beading project this month and since I was short on time I just went with the flow and let the beads take me where they would. I started with one of my own cabochons with a floral motif and created a bead bezel in matching colours. From there I added Czech glass flower and leaf beads and I was thinking at this point it might turn into a brooch. But as the shape developed I started to think more in terms of a pendant so I added some loops to the edging. This was all feeling a bit heavy and solid so i added some fringing along the bottom edge to give some sense of movement and airiness…much better I think. As the bead work is so detailed I’ve kept the necklace part very simple with watercolour chiffon silk ribbon and the final result is this necklace which I’ve called “Garden Party”. Quite a different style for me but I’m pretty happy with how it turned out. Please use the links below to see how our summer themed challenge inspired the other participants. These are the selection Sue sent me – aren’t they cute…? Whilst I had originally thought to use all three of these together time escaped me and I didn’t get to start the challenge until the very last minute so I decided to concentrate on one piece. The coral coloured star reminded me of the starfish I used to go searching for in rock pools and caves as a child so that was the one I chose to use in an ocean themed piece. Using one of my hand made molds I made a polymer clay urchin focal and before baking impressed the star into the clay to make a setting for it. Once baked I painted it with acrylic paints and then sanded it back to expose some of the clay and glued Sue’s cab into position. I’m not usually once for using glue as a connection but I didn’t want to obscure the detail of the star with a metal setting. In this context and with these materials it’s very secure and I think it works. For the necklace I picked out some beads that reflected the colours of the focal and copper wire wrapped them – recycled glass, lampwork pumpkins and ocean jasper accented with mottled sandy seed beads. A pretty copper chain with another tiny charm, an LOS (Liver of sulphur) bath for the metal/bead elements and a quick tumble and the design is finished. Now I want to head for the beach and get my toes into some sea and sand! Many thanks to Sue for providing us with these lovely pieces to work with. Please go and visit the rest of the AJE team and our guests to see what they did with their components – links below. 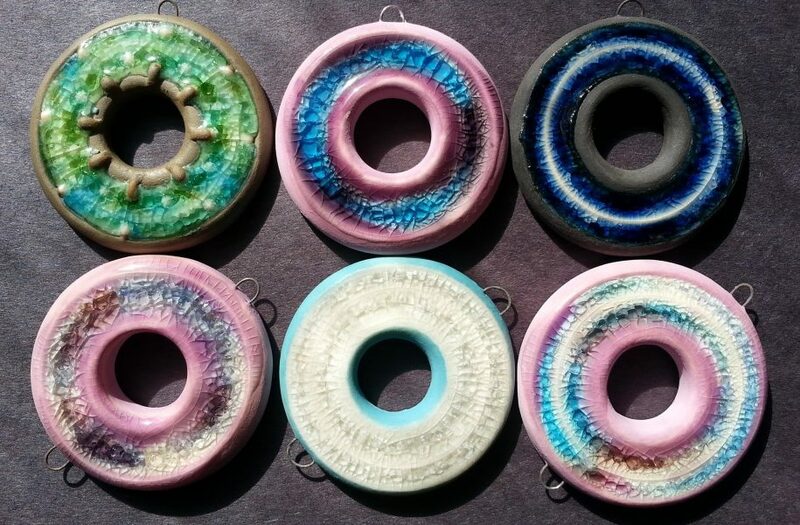 Today is reveal day for the AJE Component of the Month challenge for April and the pieces we had to work with this month were these wonderful polymer clay Amulets created by Jenny Davies-Reazor. I was lucky enough to get the gorgeous green swirly one at the bottom left of this image. When my amulet arrived the first thing that struck me was that the swirly textural design and the colour palette were reminiscent of the ocean so that was going to influence my theme. I also decided I wanted to add some sort of stopper to create a little vessel – maybe for hiding secrets or special treasures in. 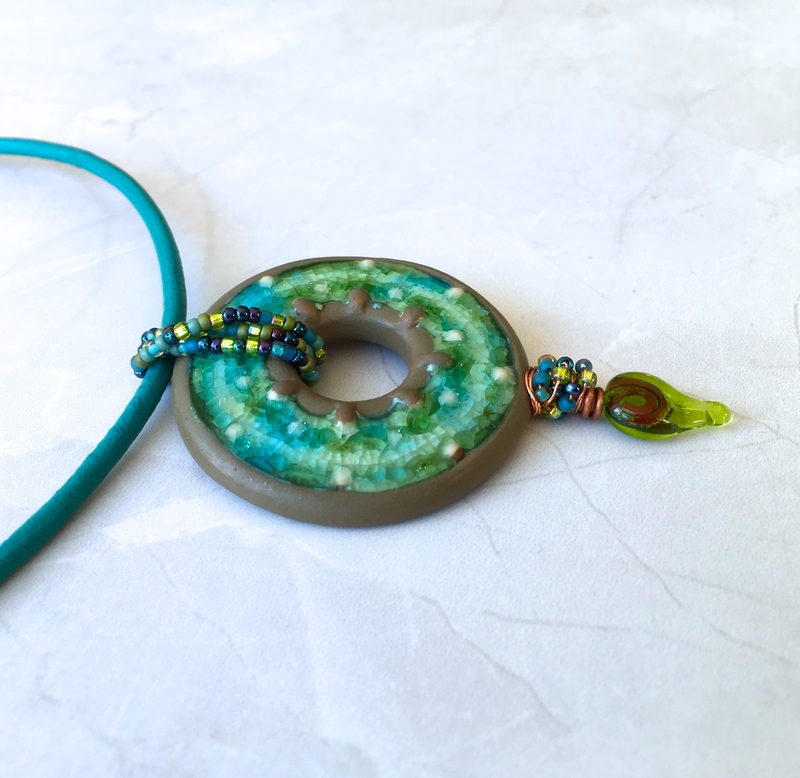 My initial thought was that I could do this with a little round bead but I couldn’t find anything that would stay put but then, while rummaging around looking for inspiration I came across my Tracey Seder-Donoughe bead stash and this one leapt out at me. Not only was it a perfect colour match but its ‘waisted’ style made it a very secure fit – perfect. I was also keen to add some sort of accent to the bottom of the amulet so I drilled an extra hole in the bottom and set about wiring it up along with the bead which I attached with a length of brass chain…so far so good. 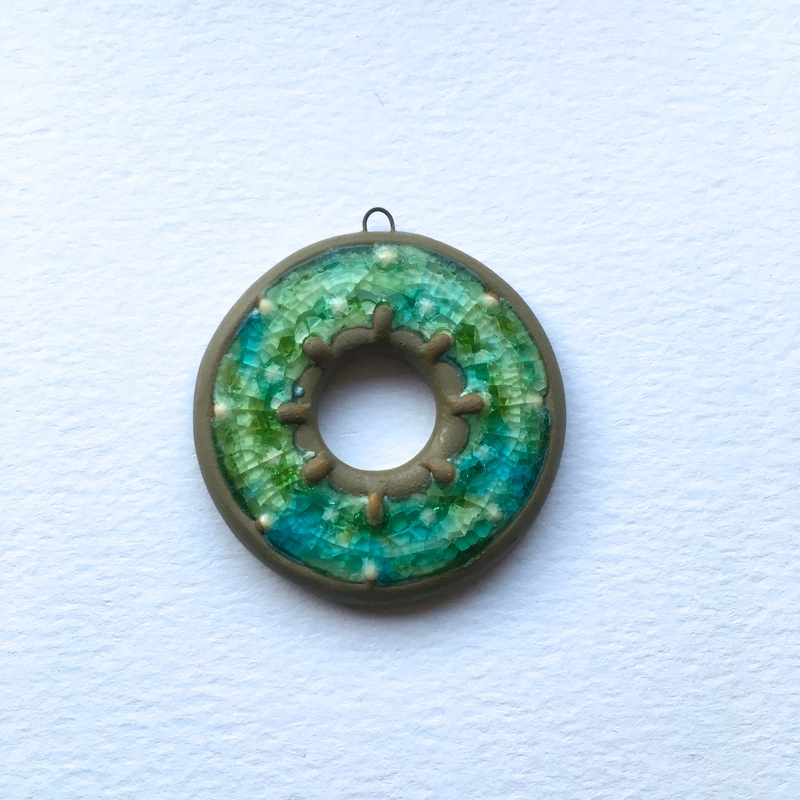 Working with the ocean theme I added one of my own bronze shell charms to the bottom of the amulet and gave this a little accent bead that picks out the darker teal tone of the piece. For me amulets tend to call for long necklaces and I decided to go with bronze chain but to give it some more depth and interest and to support the theme, I went for one of my favourite techniques and wove waxed linen threaded with tiny pearls through the chain. And that was it – job done and ‘Mermaid’s Treasure’ was complete! It’s not the easiest piece to photograph well and personally I think it looks much prettier in real life. Many thanks to Jenny for supplying such a fun piece to work with – I got fully immersed in this challenge and thoroughly enjoyed the whole process. Please do now join our blog hop to see what the rest of the AJE team and our guests created.